April 10th, 2018 – Before the commencement speeches are delivered, college seniors are locking in their graduation photos for their Throwback Thursday posts in 2035. One Tennessee student’s photo has gone viral, because she chose to do something a little different than leaning up against a tree. 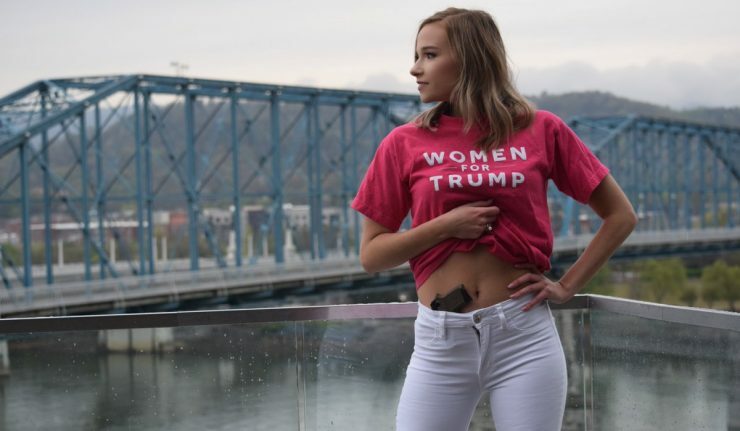 Brenna Spencer, a 22-year-old student at the University of Tennessee, Chattanooga, posted a photo to Twitter showing herself wearing a “Women For Trump” t-shirt pulled up to show a handgun in her waistband. The post currently has over 70,000 likes, but Spencer said she didn’t expect this kind of attention. “I did think that it would get a little attention but not to this degree,” she told ABC News. While she didn’t expect the magnitude of attention, she has welcomed it. Since posting the photo on Saturday she has been engaging with users who both passionately agree and disagree with her. She has had several conservative hosts applaud her for sharing her beliefs while also not understanding why the photo was even controversial to begin with. Brenna Spencer is a true inspiration. The opposing views took issue with a number of problems. There were those who supported gun rights but thought using the weapon as a prop in a photo shoot was the wrong motive. There were also those who highlighted how the reactions would be different had it been a person of color showing off a gun. And, of course, there was a comparison to the time Charlie from It’s Always Sunny in Philadelphia bragged about owning a gun. I’m 100% pro gun but brandishing a firearm for a photo shoot or showing it off to try and look cool is just stupid. They are tools. Why brag about carrying a gun? The soon-to-be graduate said she has tried to stay away from all of the comments but recently retweeted Fox News contributor Stephen Miller’s comment “Her body her choice.” Spencer will graduate in May with a major in communications and a minor in political science.